We have several Farmer's Markets right here in the middle of the city, which bring in local organic fruit, produce, & food products every Saturday. Bring your backpack to carry what you purchase, and let's shop the markets on our bikes! We meet and then take an easy tour of 3 to 5 markets around the city. We use side streets, trails and residential roads for this 8 to 12 mile ride. Not only will you learn the markets and get some exercise, you'll see beautiful areas you never knew existed in Houston and take home a bounty of beautiful produce, breads, sauces and jams! No matter what day of the week it is, you can always find a Farmer's Market in Houston that is open and has fresh, organic food to keep you healthy. 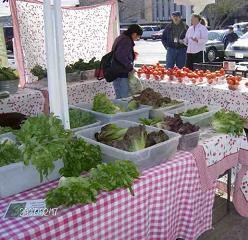 "The Farmer Market ride from Onion Creek is one of my favorites. Never having road biked before, I found comfort on the road with 60 other people and a knowledgeable leader." Don't have a bike? Don't worry! Houston B-cycle is a bike share program in Houston Texas that is operated by Houston Bike Share; a 501 (C) (3) nonprofit whose mission is "To implement, operate and expand a bike-sharing program supported by the community that offers residents, commuters and visitors a choice of ecological and economical transport, ideal for short trips and resulting in fewer vehicle miles traveled, less pollution and congestion, better mobility and more personal health and wellness." 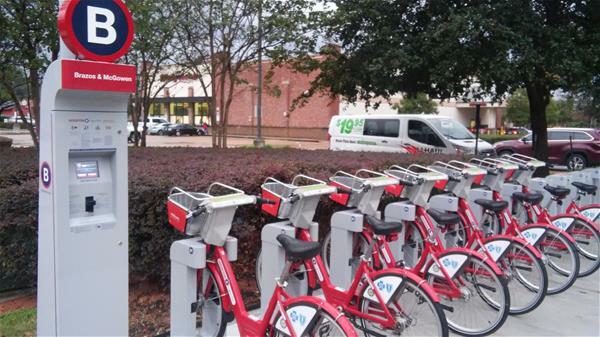 Use the bcycle app to find a station closest to you. This is your guide to when each farmer's market is open, where it is located and a link to the website! 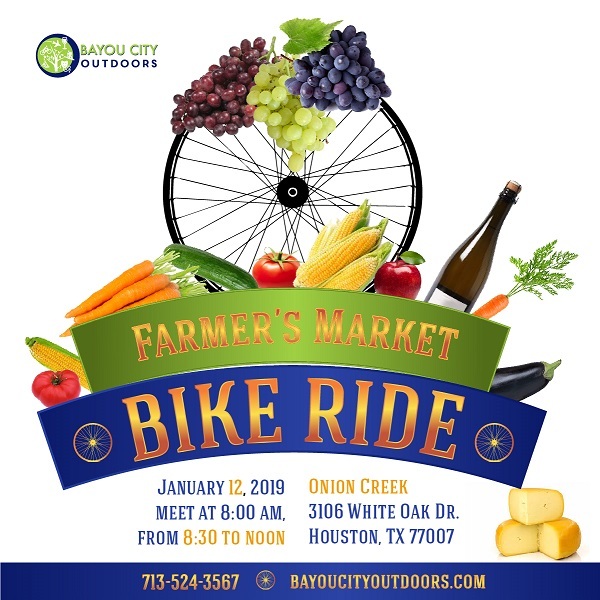 If you think the organic thing is for you, want to check out all the rave, or just want to bike around in Houston, come with us as we shop the local farmers market. Lots of folks, hoping to enjoy the benefits of higher-quality, higher-nutrition foods, make the choice to go organic. More than 60 percent of Americans - nearly twice the number in 2004 - purchased organic food products last year, and organic foods are among the fastest-growing segments of the food industry. We've all been told we should buy organic. But how many of us really know why? Not only is organic food proven to be healthier, with higher levels of vitamin C, iron and calcium, it also tastes better. Because those carrots aren't forced to grow quickly in time for the Sunday dinner rush, they can develop a depth of flavour not found elsewhere. The lower water content (non-organic foods change structure through the use of agro-chemicals and retain 26 per cent more water) not only contributes to that flavour but may also mean that, pound for pound, organic food is really the more economical option. And it's good news for those of us striving to be 'green'. The organic farming method produces less waste, and therefore less carbon dioxide into the environment. It also goes hand in hand with a higher standard of animal care and supports farmyard wildlife. Is this just a way to charge more for a bit of dirt on my carrots? Number one on any naysayer's list is the price of organic food. Studies show that your organic basket could cost up to 63 per cent more. And don't expect to buy exotic favourites all year round. Even if you can get your hands on an elusive boysenberry, chances are it will have clocked up thousands of air miles to get here. Just take a look at the long lines you're likely to find in your local natural-foods market: It still amazes me to see just how many people willingly shell out top dollar for some sort of nebulous guarantee that we're buying better health for ourselves and our families. Are we making a smart choice? A new study of US Department of Agriculture data conducted by Washington, DC-based Environmental Working Group that says particular fruits and vegetables contain substantially lower amounts of the pesticides and contaminants routinely found in conventionally produced items. Fewer chemicals equals lower health risks, making these purchases smart ones.